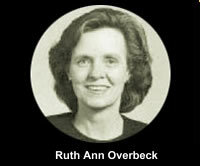 Ruth Ann Overbeck was a larger-than-life presence on Capitol Hill from the time she arrived from her native Texas in 1968 to her untimely death in 2000. In a series of interviews conducted during the final weeks of her life, she downloaded much of her voluminous knowledge of the neighborhood’s history, and her remarkable life and work inspired the Capitol Hill Community Foundation to launch the Overbeck Project in her name. For more than thirty years, while building a historical research business that frequently took her far beyond the Hill, Ruth Ann doggedly mined her adopted community for oral histories, photographs, maps and other documentation with intentions of someday writing the definitive history of the neighborhood. While she didn’t live to achieve that goal, she left numerous major contributions to our knowledge of the community’s origins and development in addition to her parting set of taped interviews. In particular, she wrote an excellent chapter on Capitol Hill in Washington At Home, an ambitious description of the city’s various neighborhoods edited by Kathryn Schneider Smith and published in 1988. Since then, Nancy Metzger updated Ruth Ann's chapter in the books's 2010 second edition. As her husband Robert Hughes notes in a memoir published by the Hill Rag, Ruth Ann chaired the original effort to define and establish the Capitol Hill Historic District. She researched hundreds of house histories for home owners in the neighborhood and designed and conducted more than thirty-five D.C. walking tours for the Smithsonian Resident Associates on various historic themes. Her resume lists an astonishing number of archeological and preservation projects, historic studies and publications, and other accomplishments. In 1992 she was honored with the Capitol Hill Community Foundation's Community Achievement Award. The complete collection of Ruth Ann's working files, house histories, neighborhood histories, and other articles and papers, filling 28 feet of shelf space, can be found at Gelman Library at George Washington University. Also note the brief remembrance of Ruth Ann that Gary Scott included in his Overbeck History Lecture on April 20, 2010. Bernadette and Jim McMahon raised two sons on Capitol Hill and have long been active with St. Peter's Church, the Boy Scouts and other community efforts. Bernadette is retired from careers as a Food and Drug Administration chemist and, later, as a consulting data base developer. Jim, an American history buff, served as an attorney for a number of government agencies and congressional committees. In retirement, he's served as a docent at the Library of Congress, the National Museum of American History, and the Supreme Court. John Franzén, our Steering Committee chairman, ran his own media consulting and production company in Washington for three decades and also served as a communications officer for the Pew Charitable Trusts. A resident of Capitol Hill since 1973 and current president of the Hill Center board, he conducted the interviews with Ruth Ann Overbeck that led to the founding of this project. Maygene Daniels and her husband Steve have been Capitol Hill residents since the 1970s. Recently retired from her position as head archivist at the National Gallery of Art, she has long been the Overbeck Project's senior adviser on archival issues, and she played a central role in researching the history of the Old Naval Hospital (site of today's Hill Center) and creating the historic signage in that facility. Stephanie Deutsch, an author who has contributed frequently to the book review sections of the New York Times and other publications, is vice president of the Capitol Hill Community Foundation. She and her husband David are native Washingtonians and longtime residents of the Hill, where they've raised three children. Elizabeth Lewis joined the Overbeck Project effort in 2008 to coordinate efforts to record recollections of individuals connected with Eastern Market. Since that time, she has edited transcripts that require special attention and served as a primary advisor to the managers. A former congressional speechwriter, Elizabeth has lived on the Hill with her husband David Abernethy for over 20 years and has served on the board of the Capitol Hill Day School, which their two children attended. Nancy Metzger has been intensively involved for many years in Capitol Hill community improvement and historic preservation efforts. She headed the successful effort to have the Capitol Hill Historic District extended down 8th Street S.E. to the Navy Yard and served from 2012–2016 on the city's Historic Preservation Review Board. The Overbeck Project is an all-volunteer organization. Since 2001, almost 150 people have contributed, as interviewers, transcribers, photographers, Steering Committee members, and advisors to the managers. This space pays tribute to volunteers who have contributed to the Project in exemplary ways. Transcribers are the unsung heroes of oral history—their efforts produce transcripts from recorded interviews and makes posting them online possible. Only the most patient and persistent people perform this task multiple times. David MacKinnon and Betsy Barnett are the Overbeck Project's most prolific and loyal transcribers. Each began volunteering in the early days of the project and continues today. Each has transcribed about 25 interviews. We can't thank them enough! The two are close neighbors, each having lived on Capitol Hill's Seventh Street for almost 50 years. 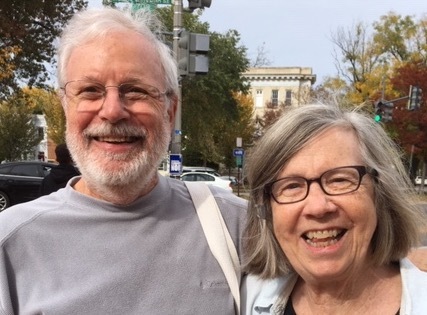 Dave and his wife Jan moved to the NE unit block in 1969; Betsy and her late husband Walter started in the 100 block SE in 1970 and seven years later relocated to the unit block SE. Each raised three children on the Hill, now all grown. Dave retired from 45 years with the Department of Defense, and Betsy from over 20 years at Capitol Hill Day School. Entering either name into our Search function will reveal a list of transcriptions produced.